Devices can use X.509 certificates to connect to AWS IoT using TLS mutual authentication protocols. Other AWS services do not support certificate-based authentication, but they can be called using AWS credentials in AWS Signature Version 4 format. The Signature Version 4 algorithm normally requires the caller to have an access key ID and a secret access key. AWS IoT has a credentials provider that allows you to use the built-in X.509 certificate as the unique device identity to authenticate AWS requests. This eliminates the need to store an access key ID and a secret access key on your device. The credentials provider authenticates a caller using an X.509 certificate and issues a temporary, limited-privilege security token. The token can be used to sign and authenticate any AWS request. This way of authenticating your AWS requests requires you to create and configure an AWS Identity and Access Management (IAM) role and attach appropriate IAM policies to the role so that the credentials provider can assume the role on your behalf. The following diagram illustrates the credentials provider workflow. The AWS IoT device makes an HTTPS request to the credentials provider for a security token. The request includes the device X.509 certificate for authentication. The credentials provider forwards the request to the AWS IoT authentication and authorization module to validate the certificate and verify that it has permission to request the security token. 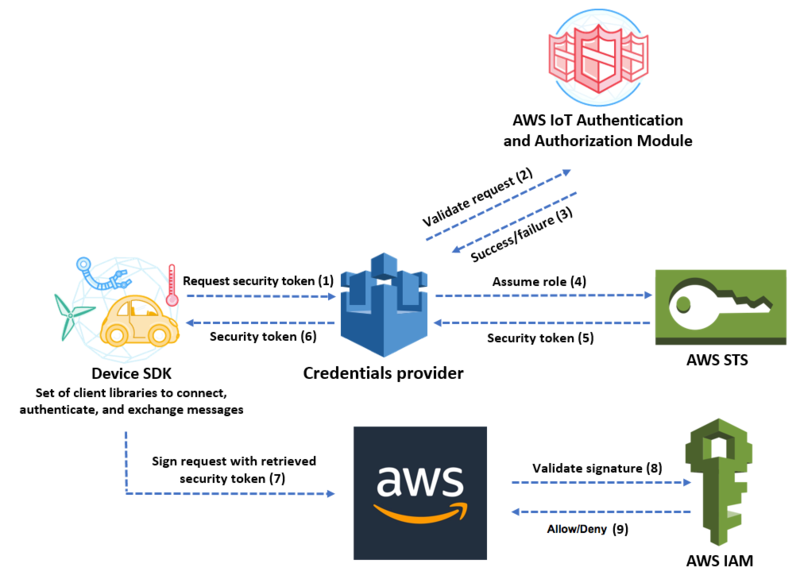 If the certificate is valid and has permission to request a security token, the AWS IoT authentication and authorization module returns success. Otherwise, it sends an exception to the device. After successfully validating the certificate, the credentials provider invokes the AWS Security Token Service (AWS STS) to assume the IAM role that you created for it. AWS STS returns a temporary, limited-privilege security token to the credentials provider. The credentials provider returns the security token to the device. The device uses the security token to sign an AWS request with AWS Signature Version 4. The requested service invokes IAM to validate the signature and authorize the request against access policies attached to the IAM role that you created for the credentials provider. If IAM validates the signature successfully and authorizes the request, the request succeeds. Otherwise, IAM sends an exception. The following section describes how to use a certificate to get a security token. It assumes that you have already registered a device and created and activated your own certificate for it. Configure the IAM role that the credentials provider assumes on behalf of your device. Attach the following trust policy to the role. When the device provides the thing name in its request to an AWS service, the credentials provider adds credentials-iot:ThingName and credentials-iot:ThingTypeName as context variables to the security token. The credentials provider provides credentials-iot:AwsCertificateId as a context variable even if the device doesn't provide the thing name in the request. You pass the thing name as the value of the x-amzn-iot-thingname HTTP request header. These three variables work for IAM policies only, not AWS IoT policies. Make sure that the user who performs the next step (creating a role alias) has permission to pass this newly created role to AWS IoT. The following policy gives both iam:GetRole and iam:PassRole permissions to an AWS user. The iam:GetRole permission enables the user to get information about the role that you've just created. The iam:PassRole permission enables the user to pass the role to another AWS service. "Resource": "arn:aws:iam::your aws account id:role/your role name"
Mandatory. An arbitrary string identifying the role alias. It serves as the primary key in the role alias data model. It contains 1-128 characters and must include only alphanumeric characters and the =,@, and - symbols. Uppercase and lowercase alphabetic characters are allowed. Mandatory. The ARN of the role to which the role alias refers. Optional. How long (in seconds) the credential is valid. The minimum value is 900 seconds (15 minutes). The maximum value is 3,600 seconds (60 minutes). The default value is 3,600 seconds. For more information about this API, see CreateRoleAlias. Attach a policy to the device certificate. The policy attached to the device certificate must grant the device permission to assume the role. You do this by granting permission for the iot:AssumeRoleWithCertificate action to the role alias, as in the following example. "Resource": "arn:aws:iot:your region:your_aws_account_id:rolealias/your role alias"
Make an HTTPS request to the credentials provider to get a security token. Supply the following information. Certificate: Because this is an HTTP request over TLS mutual authentication, you have to provide the certificate and the corresponding private key to your client while making the request. Use the same certificate and private key that you used when you registered your certificate with AWS IoT. To make sure your device is communicating with AWS IoT (and not a service impersonating it), refer to the documentation on Server Authentication in AWS IoT Core, follow the links to download the appropriate CA certificates, and then copy them to your device. RoleAlias: The name of the role alias that you created for the credentials provider. ThingName: The thing name that you created when you registered your AWS IoT thing. This is passed as the value of the x-amzn-iot-thingname HTTP header. This value is required only if you are using thing attributes as policy variables in AWS IoT or IAM policies. Run the following command in the AWS CLI to obtain the credentials provider endpoint for your AWS account. For more information about this API, see DescribeEndpoint. The following JSON object is sample output of the describe-endpoint command. It contains the endpointAddress that you use to request a security token. Use the endpoint to make an HTTPS request to the credentials provider to return a security token. The following sample uses curl but you can use any HTTP client. This command returns a security token object that contains an accessKeyId, a secretAccessKey, a sessionToken, and an expiration. The following JSON object is sample output of the curlcommand. You can then use the accessKeyId, secretAccessKey, and sessionToken values to sign requests to AWS services. For an end-to-end demonstration of a specific use case, see How to Eliminate the Need for Hard-Coded AWS Credentials in Devices by Using the AWS IoT Credential Provider.